AUSANGATE RAINBOW MOUNTAIN 4 DAYS. A hike surrounding Ausangate the snow-clad-mountain, overview the Vilcanota Mountain range and visiting Vinicunca, the colorful mountain you where you end up doing two dramatic sceneries in a 4 days trek. Why Ausangate Rainbow Mountain 4 days? 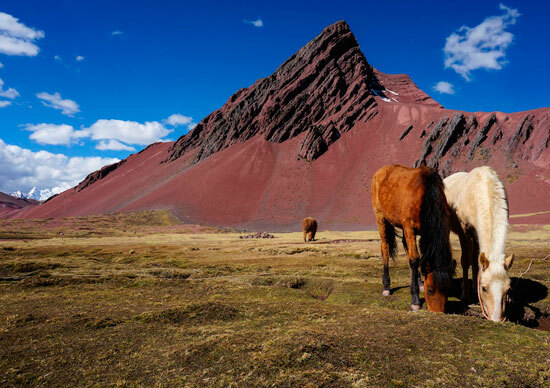 Because will satisfy the most demanding and will get unforgettable memories as sumptuous panoramas of high mountain, formidable glaciers and crystalline rivers, turquoise lakes, peaceful pastoral scenes of the herds of spangled and alpacas kept on by Andeans with multi-coloured clothing. Ausangate Rainbow Mountain 4 days is a new route. 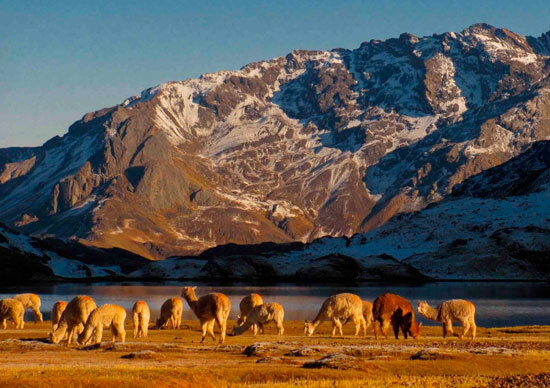 All this time was there but went unnoticed, a true adventure through a nature preserved and wild, where the only meeting which you make will be, typical camelids (Vicuñas, Llamas, andean squirrels) a several color lagoons and small communities. Type of trip: Adventure, Nature, Culture. 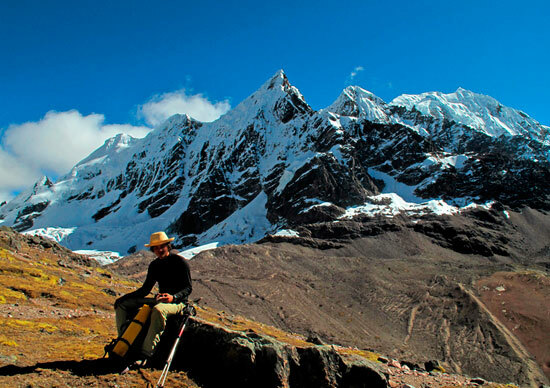 Travel Style: trekking, camping, local communities, highest mountains, hepherd’s paths. Duration of experience: 4 days and 3 nights. This early morning our minivan drive us Cuzco (3326M,10912,07Ft), Upis (4400M,14435,7Ft), relax, acclimatize to the higher altitude for a while, a 6 hours hike takes us across Quimsacocha (4797M,15738,19Gt), we hike through an variety The Ausangate region is incredibly colorful as its four lagoons YANACOCHA, VINOCOCHA, HUCHUYPUCACOCHA, HATUNPUCACOCHA, then Apacheta (4756m,15603,67Ft) area where we arrive for a camping and overnight, this is the longest day, almost 1000m climb! looks too difficult, but worth it!. After breakfast, our trip bring us more surprises, we will meet native communities of Quechua-speaking Inca descendants that exploit the vast wide ones of Altiplano, snowcapped mountains, shepherds path, alpacas and maybe the andean condor then to the magical landscape of Vinicunca. 2 hours more hike takes us toward Alqatarwi, where we camped and overnight. Here we will see vicuñas and maybe the famous andean condor, to shorten the climb this is a relatively short day and eventually encounter the waterfall of OSQOLLOÑAN, (CAT WATERFALL) We ended up having a marvelous time and arrive to Cusco. The Altitude in this region affects different people in different ways, but common symptoms of altitude sickness include headache, nausea, loss of appetite, trouble with sleep, and lack of energy. To help prevent altitude sickness, we recommend you always remain well hydrated, gradually expose yourself to higher elevations, exercise moderately until altitude acclimatized, and get plenty of rest. Most importantly, we suggest that you arrive in Cusco at least 2 to 3 days prior, Because altitude issues are intricately tied to dehydration, once in Cusco you should increase your fluid intake as MUÑA tea (tastes like mint) or Coca tea, makes you feel better, limit alcoholic beverages, caffeine, and aspirin, which tend to dehydrate your system.